Uglyworld #864 - Taking Things "Loo" Far (319-365), originally uploaded by www.bazpics.com. After leaving the pot boiling away on the stove too long yesterday and getting a verbal ear bashing from me, I went looking for by eReader today to read something myself and found it missing. If it hadn't been for hearing giggling coming from the bathroom I wouldn't even have thought about looking in there for it, and low and behold when I opened the door I found Wage lets just say "busy" and my eReader in front of him with his apron draped over it's top corner. "Oi's, whats the hells, I is busies here, gets outs" Wage yelled at the sight of me at the bathroom door with the camera. Just wait till he gets out of the bathroom, I think someone needs a lesson in hygeine, especially when it involves my stuff...!!! 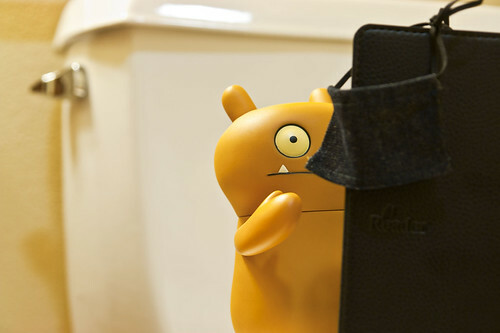 Even Wage needs some privacy in the "Loo"! But I'd hide my eReader if I were you!